The trip provided an opportunity for their most extensive conversation since reports that the deputy AG had discussed possibly secretly recording the president. 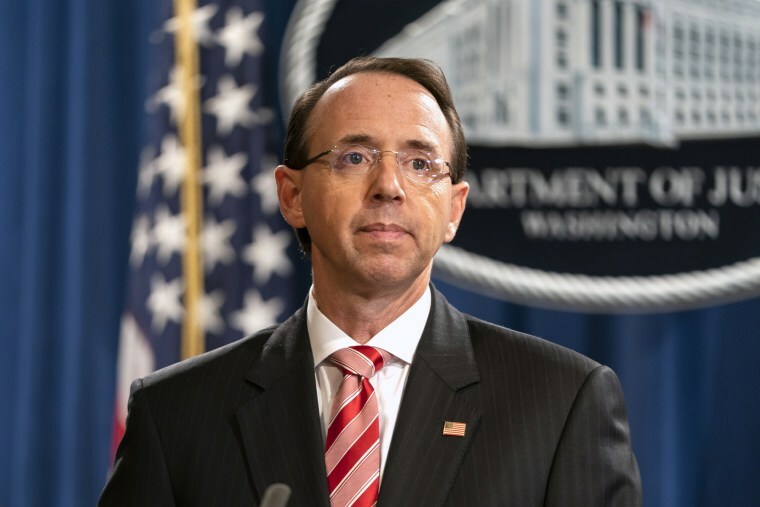 WASHINGTON — Deputy Attorney General Rod Rosenstein is flying Monday with President Donald Trump on Air Force One to a police chiefs' conference in Florida and the president said before leaving that he has no plans to fire the overseer of special counsel Robert Mueller's investigation. "No, I don't," Trump responded when asked if he planned to remove Rosenstein. "Looking forward to being with him," he added. "We'll be talking on the plane. I have a good relationship other than there's been no collusion." After landing in Florida, Trump described his conversation on the plane with Rosenstein as "great." A White House spokesman later issued a statement saying, "The President and Deputy Attorney General, Rod Rosenstein, met for about 45 minutes aboard Air Force One. They discussed various topics including the International Chiefs of Police event later today, support for our great law enforcement officials, border security, how to better address violent crime in Chicago, and general DOJ business." The flight provided an opportunity for their most extensive conversation since news reports last month that Rosenstein had discussed possibly secretly recording Trump to expose chaos in the White House and invoking constitutional provisions to get him removed from office. The reports, which Rosenstein denied, fueled speculation that Rosenstein might be fired or resign. Rosenstein told officials that he would be willing to resign and met at the White House with chief of staff John Kelly during a chaotic day two weeks ago that ended with him still in his Justice Department job. Rosenstein and Trump had been expected to meet at the White House days later, but that meeting was put off so that the president could focus on a confirmation hearing for Supreme Court Justice Brett Kavanaugh. Trump has said previously that Rosenstein has told him he did not say the remarks attributed to him. That suggests Rosenstein's job is safe until at least the midterm elections next month. Trump is scheduled to speak Monday at the International Association Chiefs of Police conference in Orlando. Rosenstein oversees the special counsel's investigation into possible coordination between Russia and the Trump campaign. Although Trump has at times criticized his deputy attorney general, he has reserved his sharpest verbal attacks for Attorney General Jeff Sessions, who recused himself from the Russia investigation in March 2017 because of his involvement with the Trump campaign.